Since the 19th century people have been moving people with rickshaws. By centering most of the “shaws” weight on the center of gravity of the two wheels, and pulling the front, it’s easy to move incredible amounts of weight. 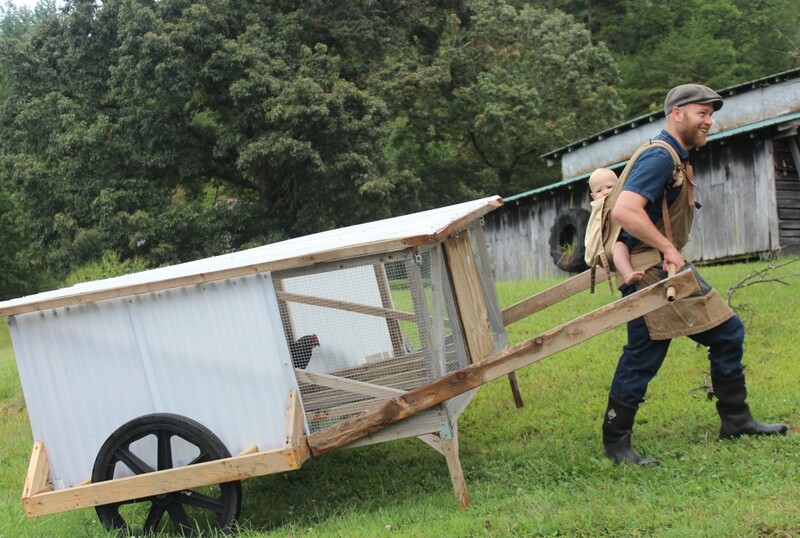 Because now, I’m taking that old technology to start moving (and housing) my chickens. 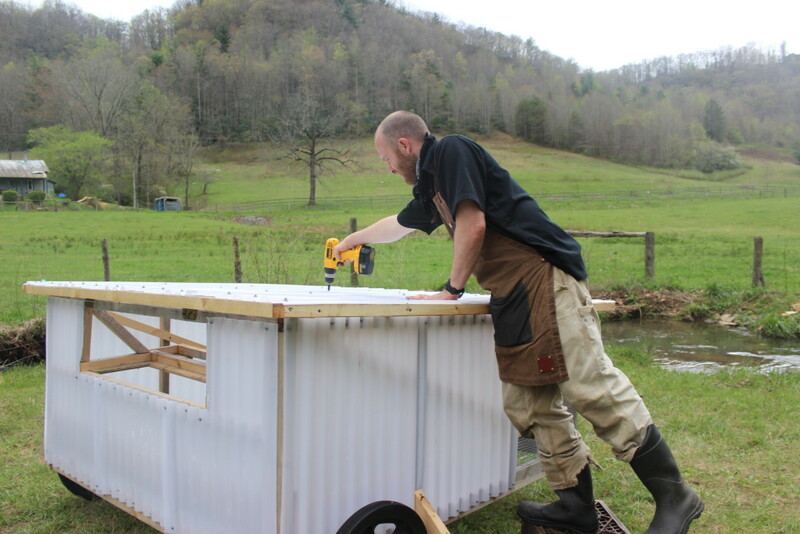 The future of small scale chicken housing is here. 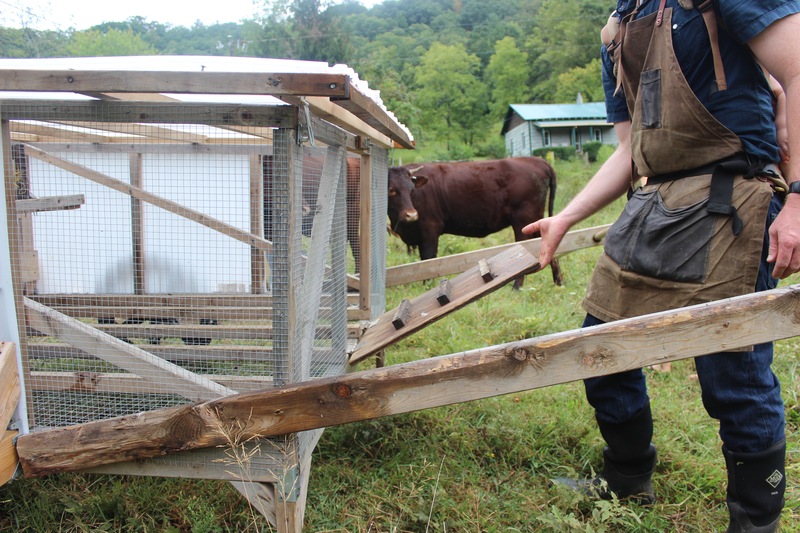 Chances are, your chickens are WAY overdue for a move. Most folks keep their chickens in a “classic” coop and run, but that just so happens to be one of the most labor intensive, and unsanitary methods for raising chickens. 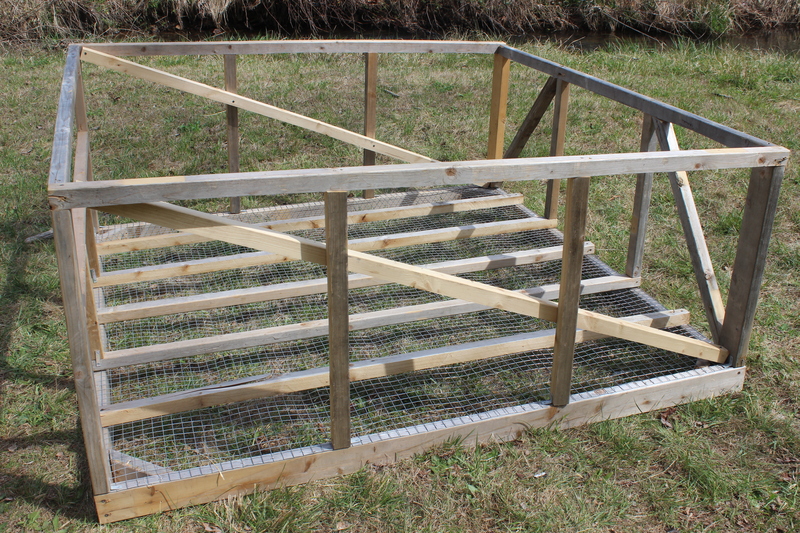 It’s now possible to move your chickens regularly with electric poultry net and my ChickShaw, even if you have a lot of birds (like 36). 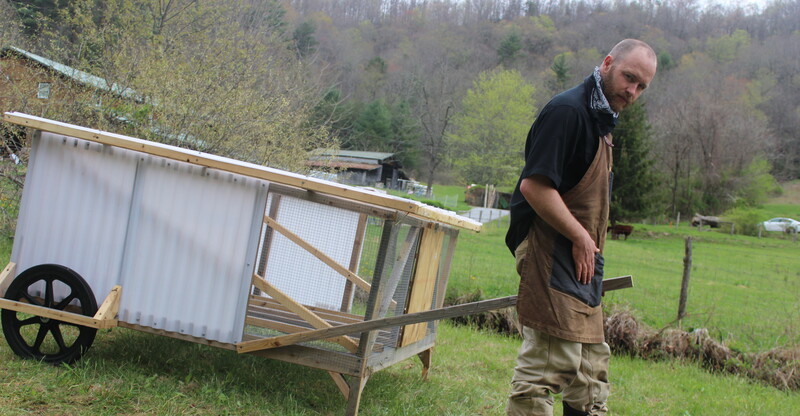 Before now, mobile chicken housing was limited to “tiny houses” chicken tractors and mobile home sized coops. 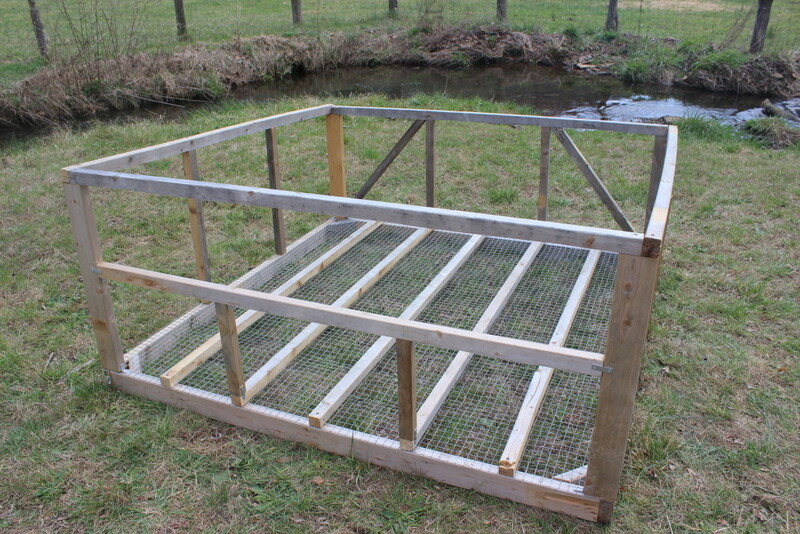 Now, the homesteader can move his flock of 12-36 all by himself (or herself) over all kinds of terrain. And, it’s not just light weight. I’ve built in several design features that will make everyone’s life a bit easier. Perches are built into the floor to save height and weight making it easy to move while keeping costs low. 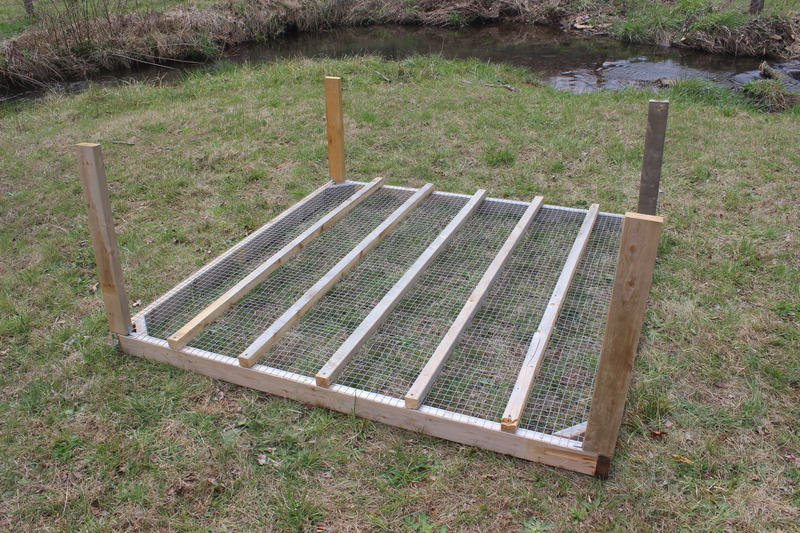 The floor is also the perches (saving room) and the 1″ wire mesh keeps out the predators. The door is also the ramp, making it super easy shut them up at night and let them out in the morning. 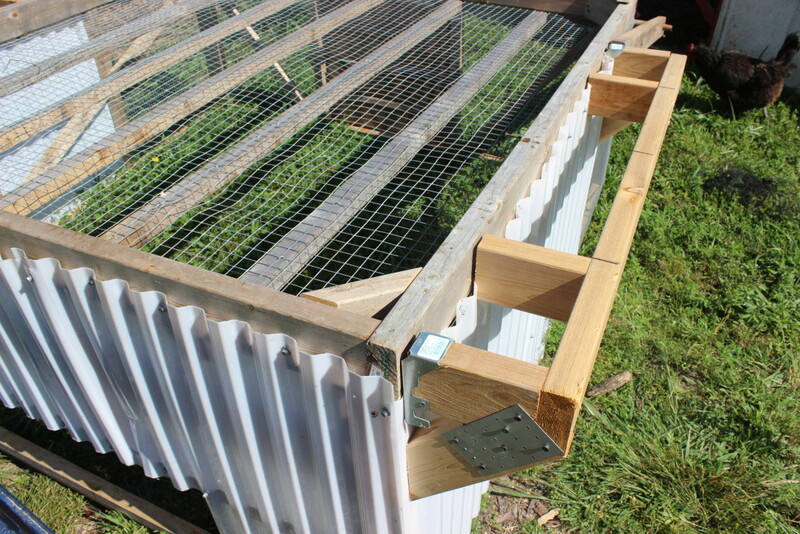 The roof is on hinges for those time you need to access chickens, or place something inside (like a dust box). the roof hinges up for easy access. 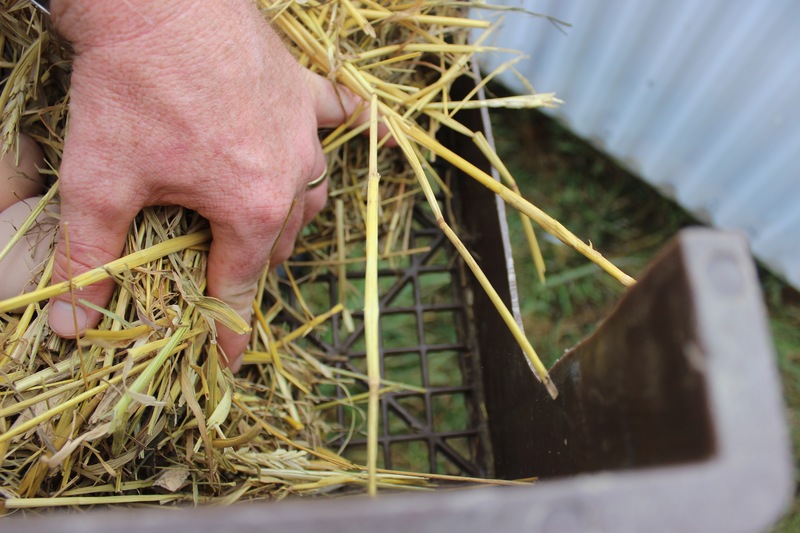 The handle for pulling the “Shaw” is easily removed for easy access and can be use to prop up the roof lid. the handle is easily removed for easy access. the handle also serves as the prop for holding up the roof. Large, non-pneumatic wheels can’t go flat and will traverse crazy terrain. Plus, they’re tall enough so that the chickens can get under the house for shade and aerial predator protection during the day. 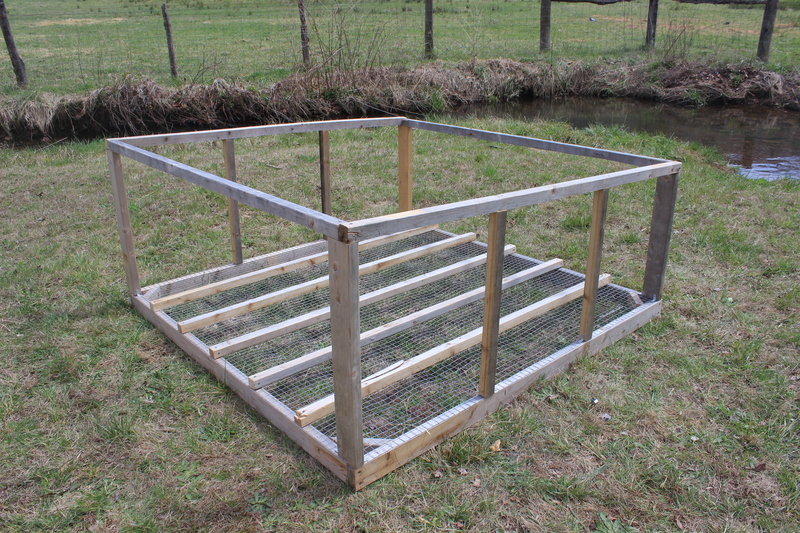 Uses my self cleaning, “pre-made”, milk crate, nesting box design that you can access individually from the outside. 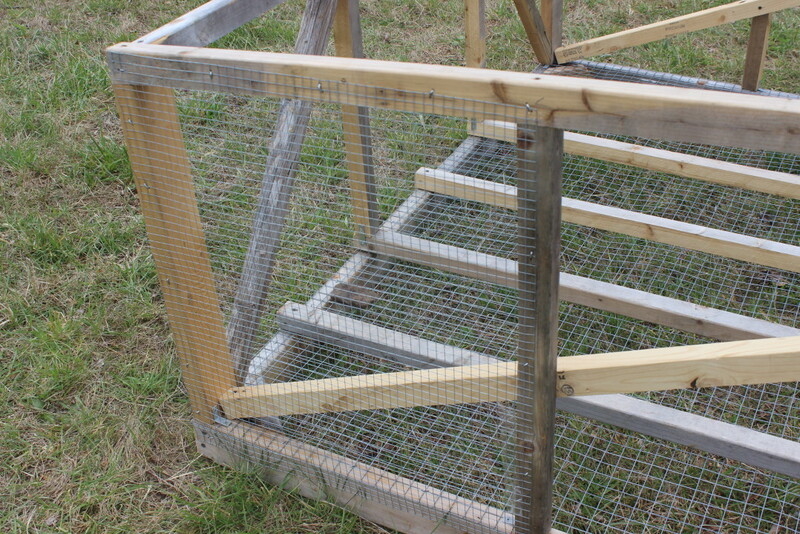 No more going in the coop for eggs. 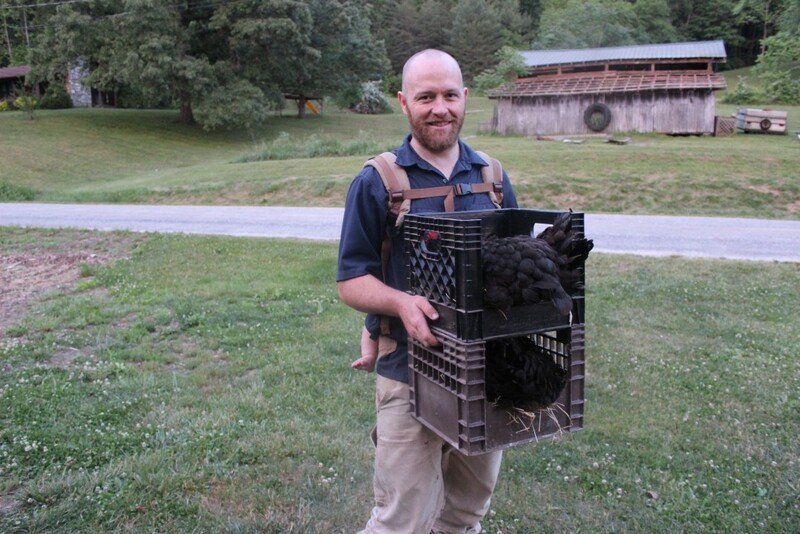 And if you forget your egg basket or need to transfer a broody hen. Just use the milk crate! Access the nesting boxes from the outside. 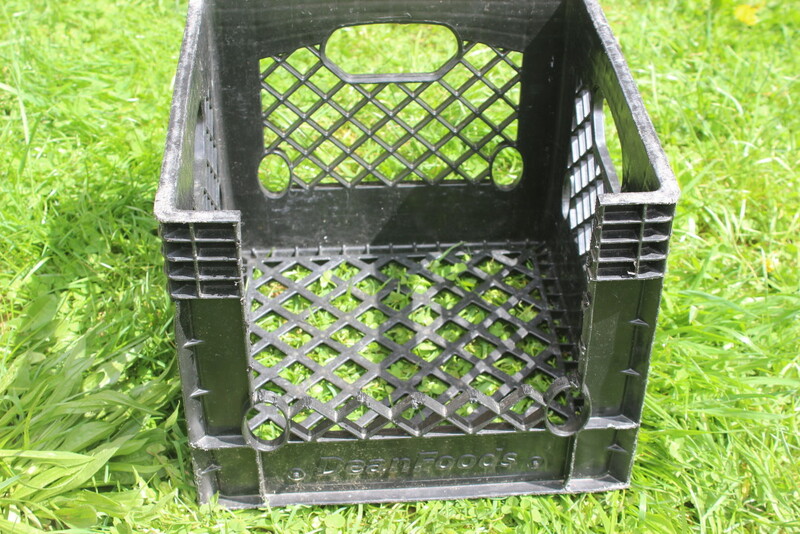 “Caged” bottoms on milk crates make a self cleaning nesting box (the dirt falls through). 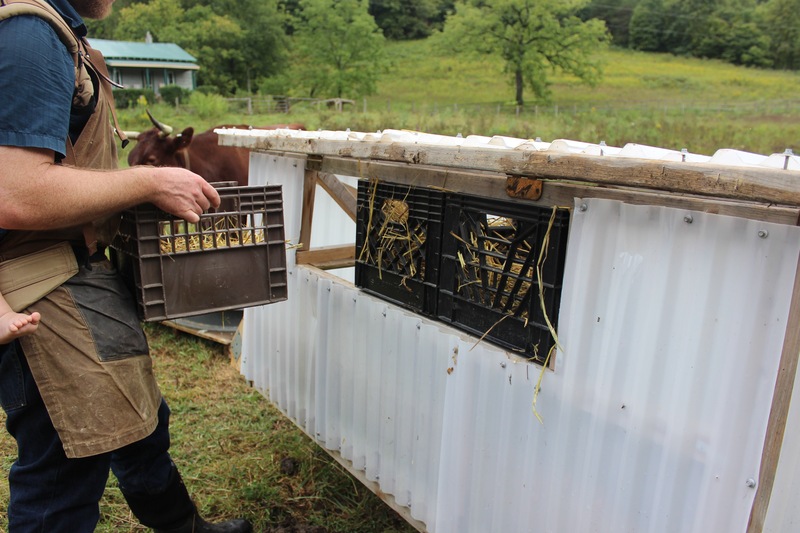 The mobile crates work great for moving broody hens in place. 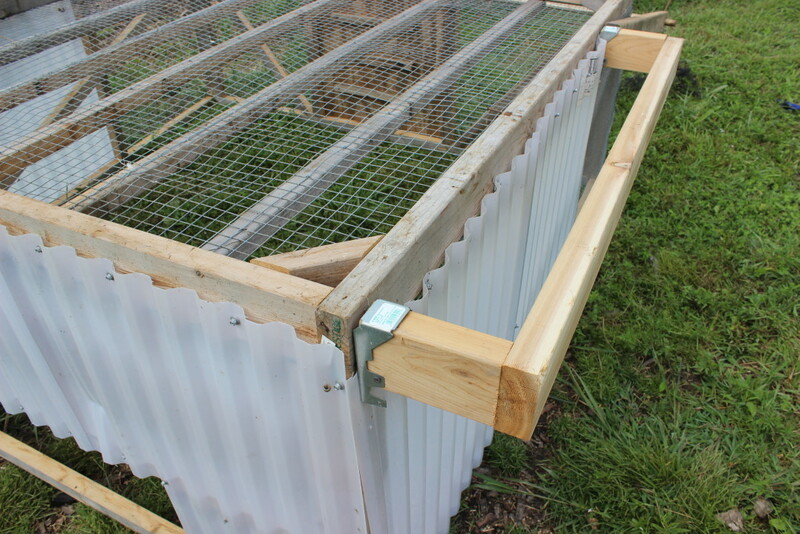 If you need more info on how to manage chickens in a mobile paddock system, check out Rich Soil’s article, “Raising Chickens 2.0 – No More Coop and Run”. At least 16” of 1X2 or very similar. Note: Cedar is naturally weather-resistant and non-toxic, but it’s expensive. You can save money by purchasing NON pressure-treated lumber, but you’ll need to paint the wood or apply a sealer, being sure to use an eco-friendly (non toxic) source. Seven pieces Tuftex SeaCoaster PVC Roof Panel, 8’X2.17’ (for the roofing and siding). Two 9” X ¾” bolts (an inch or so longer wouldn’t hurt), to serve as axles for the wheels. I found mine at a local bolt and nut shop (the local hardware store didn’t carry them this long). Here I found some online that should work great. Two Marathon Flat Free 26X2.125” tires at Northern Tool. Two ¾” rigid couplings (for spacing the wheel from the frame). Two ¾”X2” washers (for keeping the wheels from rubbing the frame). Two Angle clips 1-7/16” X 2” (for strengthening the front legs). Twenty-four Framing Angles 1.5” X 1.625” X 1.25” (for reinforcing our framing). Four Mending Plates, 5” X 3⅛” (for adding strength to your wheel frames). Four Joist Hangers, 2” X 6-8 (for mounting your wheel frame to the Chickshaw). Three milk crates. I somehow have a bunch of these, so I just used what I had. If you don’t have any, you might be able to get some used at a grocery store or something, but if not, here’s a link to some on Amazon. One 6’8”-long pole (ideally 1 ¼” diameter, give or take) for lifting and pushing/pulling the Chickshaw. You could go slightly longer (probably 7’) and slightly thicker (but no more than 2” thick). At least 9’3” of ½-inch hardware cloth for the side walls. At least 18’ of 1” hardware cloth for the “flooring”. Four, 3.5” door hinges for the door and the roof. Five Lb of 8X3 deck screws (that’s 3” deck screws). One Lb box of ¾” Poultry Net Staples for hammering in your hardware cloth. Four, ½” metal pipe straps for attaching your wheel axles (bolts) to the frame. 100-200 roofing screws, 1½, #10’s. (I’d get at least 100, but maybe 200. I’d rather have some leftover than not enough). Two, 3½” Safety Hasps for locking down the roof. Drill and appropriate drill bits. I used phillips screws, so I’ll use a phillips head drill bit. ¼” Bit Tip Holder drill bit for screwing in your roofing screws. Sawzall, hand held PVC saw or other hand held saw that can cut plastic. Tin Snips for cutting your plastic roofing. 1½” Hole Saw for drilling a hole into the arms for your “pulling poll”. I went ahead and got a four piece set, because these hole saws seem really handy. 6” long, Screw Driver Bit for drilling in your hard to reach Safety Hasps. Cut another one of the extra 24” pieces into two 9½” pieces and scrap the leftovers. Cut two of the 19” leftover pieces to 13½”, and scrap the leftovers. Cut two of the 19” leftover pieces to 13 5/16”, and scrap the leftovers. Cut one panel into two 31” pieces and one 29 3/16” piece. Cut a 29 3/16” piece from another panel and scrap the leftovers. Cut four panels at 80” and scrap the leftovers. Let’s get started with the fun part. Put together two 6’ 2X4’s and two 5’9” 2X4’s to form a 6’ square. Be sure to have your two 5’9” pieces on the inside. Take your four 8” 2X4’s and cut @ 45 degree angles to form your corner braces. 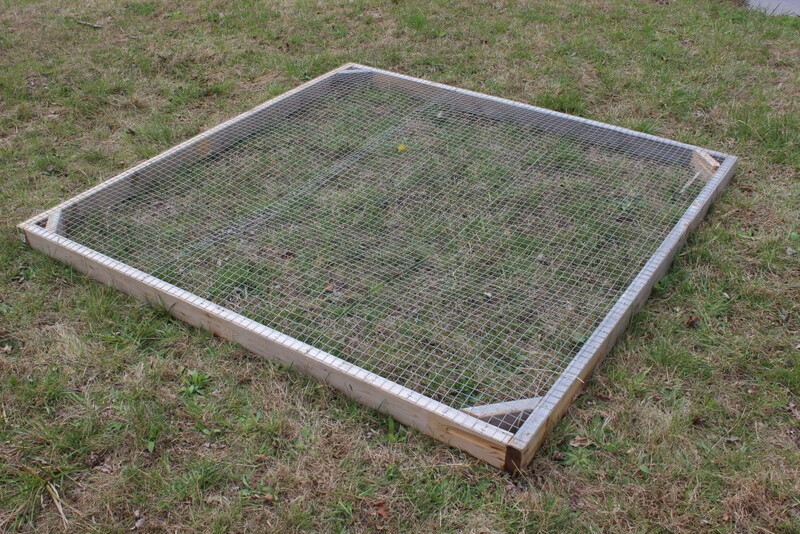 Cut your 1” wire mesh into three 6’ lengths and attach to the top of the frame with small u-nails. Attach your five 6’ 2X2 perches every foot across the platform. Just a little fun fact to clear up any confusion you may or may not have. 2X2’s and 2X4’s aren’t really that. A 2X4 is really 1¾” X 3½”, so a 2X2 is different, too. Don’t worry about it. Everything works out in the end. For the sake of simplicity, I’ll continue to “lie” by saying we’re using 2X2’s and 2X4’s. And yes, 1X4’s are a lie too. Forgiveness. Flip the platform over and attach your mesh onto the bottom of the perches for added security. Now, flip it back to its original position. Screw in your two front posts (2’X4’X24”) using some of your framing angles. For these corner posts, I used two framing angles on the bottom of each post. At this point, It doesn’t matter which side you choose to be the front and back. 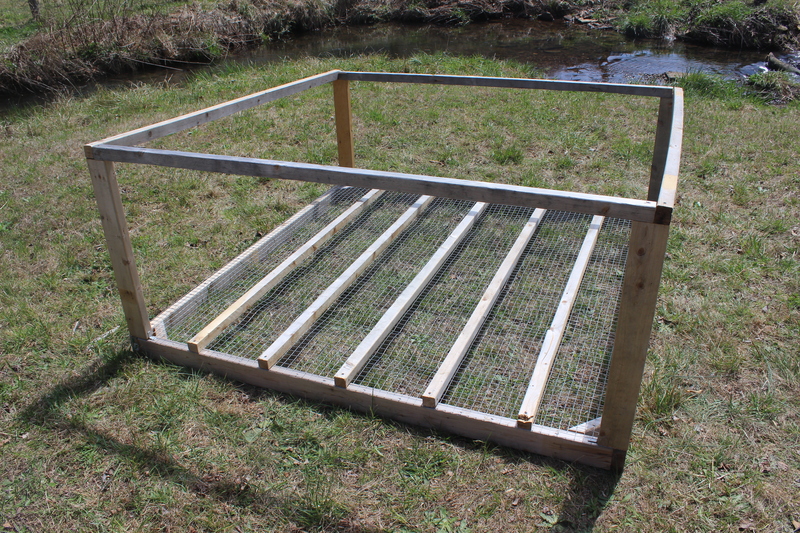 I set it up so my perches are running front to back as opposed to running sideways. For reference, the front side in this picture is the side closest to the creek. It’s important to position your 2X4’s as seen in the picture. I have the 2X4’s wide side facing the front and back “walls”, if that makes any sense. Hey, just copy the photo and you’ll be golden. 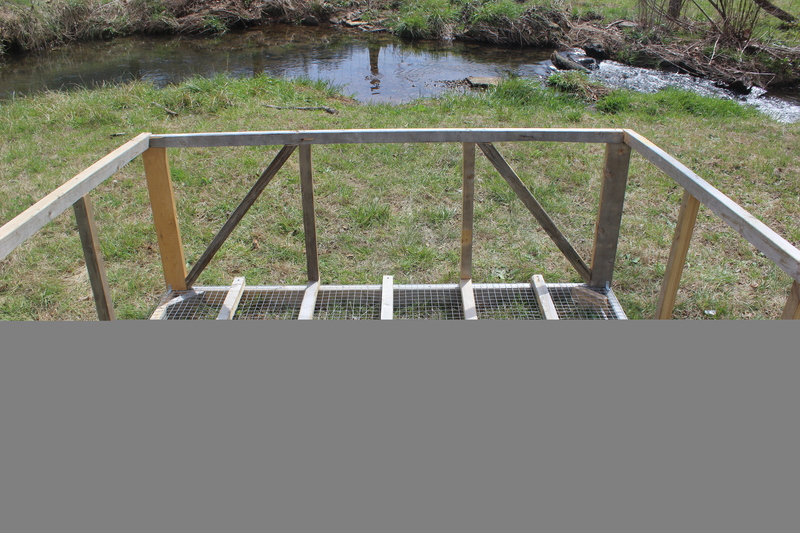 Screw in your two back posts (2’X4’X28”), wide side facing “out” and secure with framing angles. Ok, this is fun…I hope. Well, I bet you’re having more fun than I had when I built this from scratch… or maybe you’re saying, “these instructions are crazy”. Hey, I welcome all feedback, even if it’s derogatory. Ok, let’s put the top frame on. This time, use 2X2’s. Take 6’ pieces and use them for your sides and, you guessed it, two 5’9” pieces for your front rails. Rails? I guess that’s what you call that. Anyway, look at the picture, it’s shouting a thousand words I don’t know how to say. Here’s another tricky part. This pic is deceptively simple, I warn you. But I know we can do this. Do you see the four vertical posts along the sides, in the photo below? Not the corner posts, but the side posts. 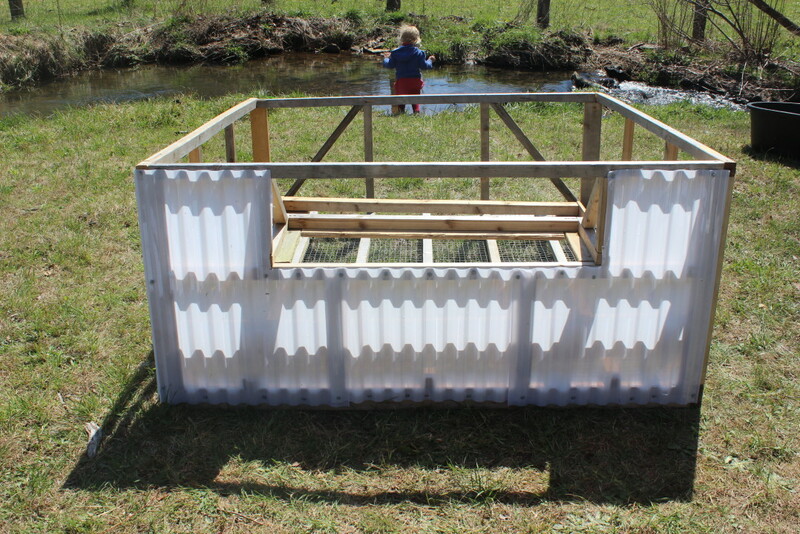 The ones in the front (towards the creek) are your 2X2X25½”. 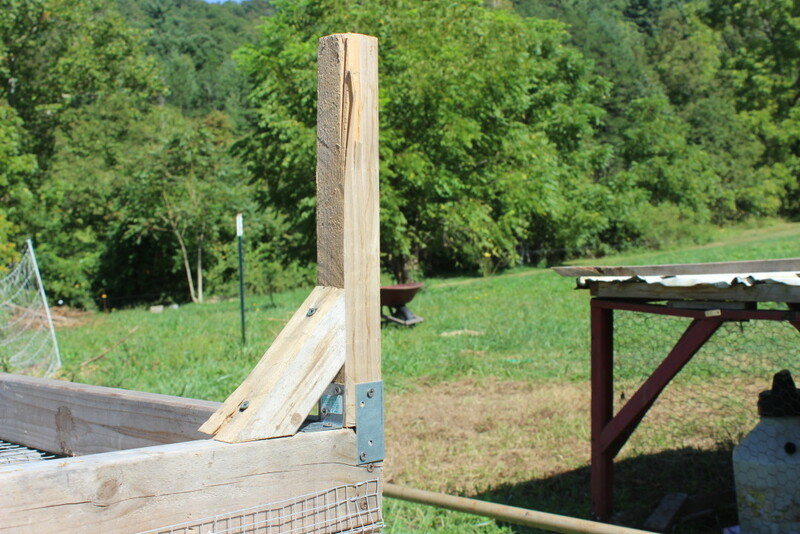 Now, cut that angle, and attach the bottom of the post with one frame angle and attach the top by screwing through the top “rail” into your post. Repeat with the other side. Repeat steps 9 and 10 for the two vertical posts towards the back. These are your 2X2X27”. If you thought our last angle cuts were crazy, we’re about to go “bat crap crazy”. See the two vertical posts in the middle? That’s easy. It’s the angle bracing posts that are a little tricky to explain. But you’re smart. Let’s start with the easy. Take your two 2X2X22½” and insert them into the front wall, two feet from either side. Notice how they so conveniently rest on top of the perches. Screw the bottom in with a framing angle and screw the top in by screwing through the top rail. For those angel braces, go ahead and cut two 2X2X30 7/16 ”. Yes, that’s 30 inches and 7/16” combined. Hold your braces up, one at a time, and mark your angles and cut accordingly. If you mess up a bit, it’s not that critical. In fact, I was tempted to just go back and measure how much it would be to run a straight piece in (no angles) but the angles look good. Ok, take a deep breath. No more angle cuts. These next three pieces are easy. See that horizontal piece going across the middle of the back? That’s your 5’5” piece. Go ahead and screw it in. 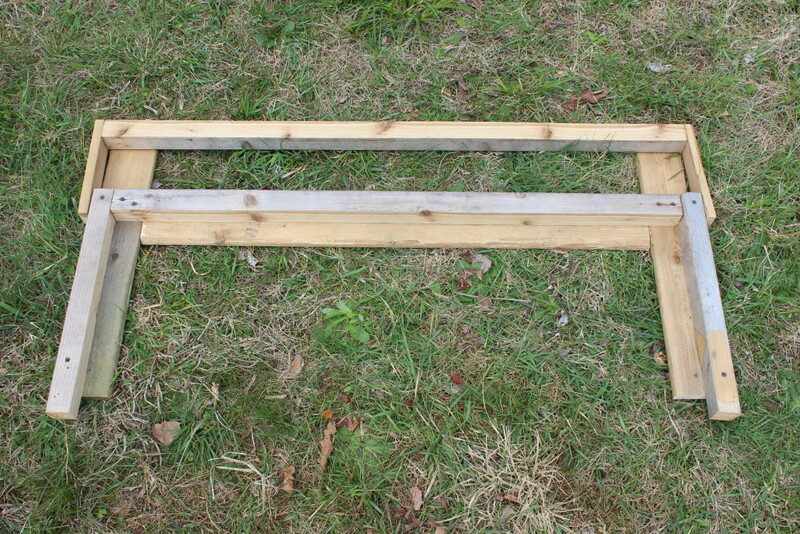 I would use a couple of framing angles, one on either side, to screw this piece into your 2X4 corner post. Oh… I almost forgot. 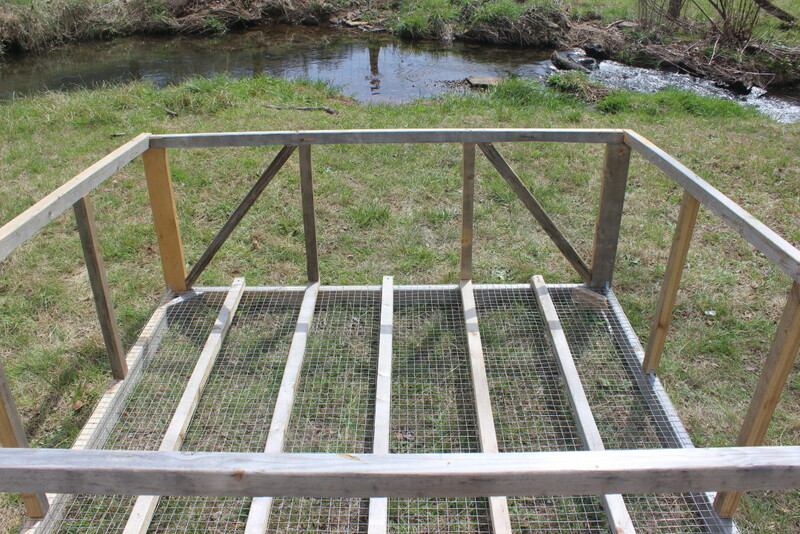 Place the horizontal board 15¼” up from the bottom framing. Just to make sure I communicate this right. 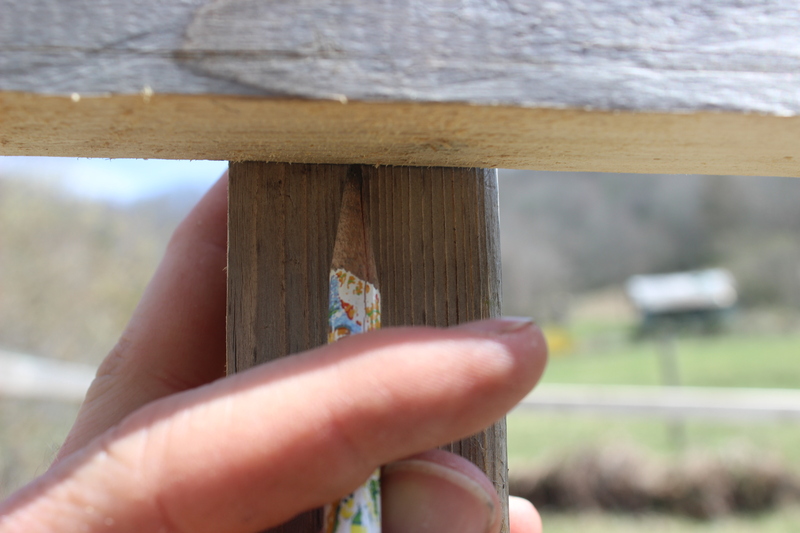 Measure 15¼” from the top of the bottom 2X4, and make a mark at 15¼” on your two back corner 2X4’s. Now, you’ll want to place your 5’5” horizontal 2X2 just above the line (do not center your horizontal board on this line, but rather put it on top). Got it? Good. 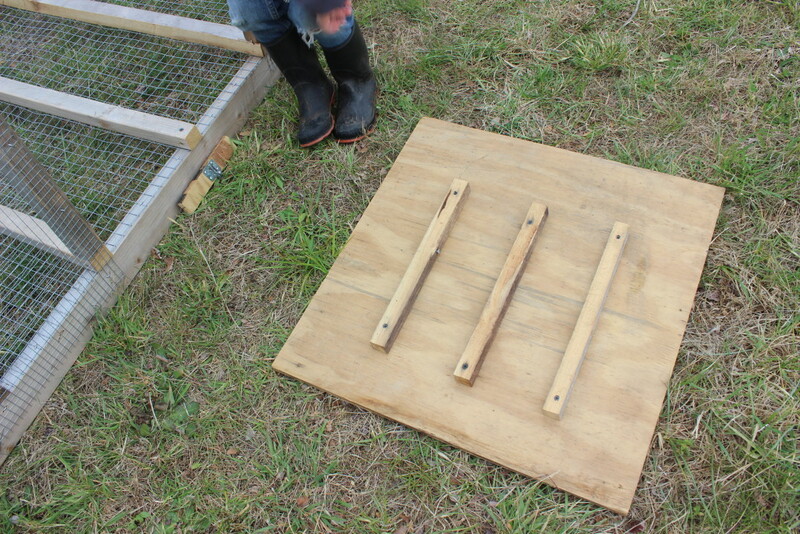 Take your two 2X2X13-5/16 pieces and screw them in 2’ from either side. See the photo. Doesn’t that look nice? Use framing angles to secure the bottom and attach the top by drilling through the horizontal 5’5” piece down into the posts. I didn’t use the framing angles or drill in from the top in the picture, but If I had to do it over again, that’s exactly what I’d do. By this point, I’d given up on all those crazy angle cuts. For these diagonal braces I just made straight cuts.. and these are on the inside, so it doesn’t look bad. Now, get ready to put on our ½” hardware cloth. We’ll only need it for the two sides on the front “wall” and the two front sides on the side “wall”. Cut two 27½” pieces and staple nail them into the front two side on the front wall. Now, cut two 28” pieces and staple nail them into the front two sides on the side walls. Are we having fun? Well, if not take a break for some tea. My permaculture teacher, Geoff Lawton says, “if it stops being fun, take a break for some tea and adjust the plan as needed”. Ok, if you don’t want tea, at least take a deep breath, stretch, whatever. Ok, welcome back. Look at the picture below. That’s the base of the nest box. Simple right? Right. Go ahead and put your three 2X2’s together. 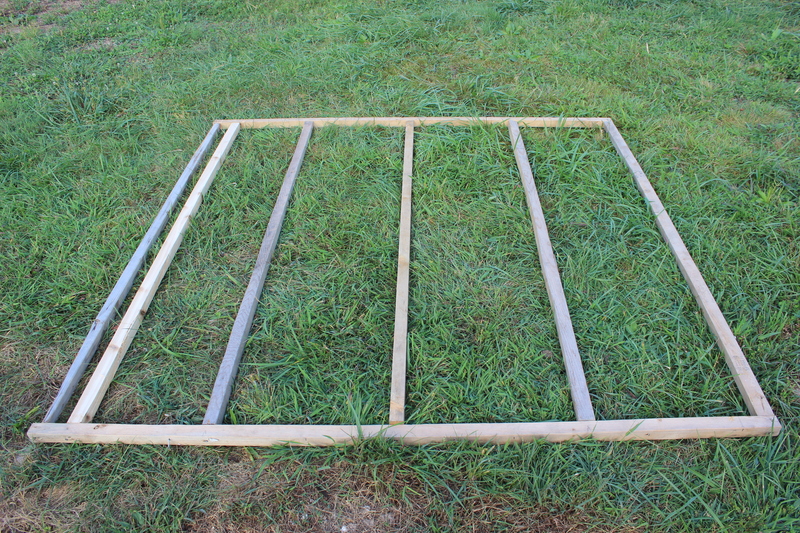 This is easily done by screwing your two 15” 2X2’s onto either side of your 2X2X40”. Now, screw in your two 1X4X19½” into the bottom. I did this by flipping it over. Notice how the 2X2 framing rests on the side of the 1X4’s and that the bottom of the 2X2 framing sticks out 1½”. That’s so we can mount this to our main frame later on. Then, screw your long, 1X4X36½” into the bottom of your 2X2 cross piece. I think it’s best to go ahead and put (what we call) your landing bar together. 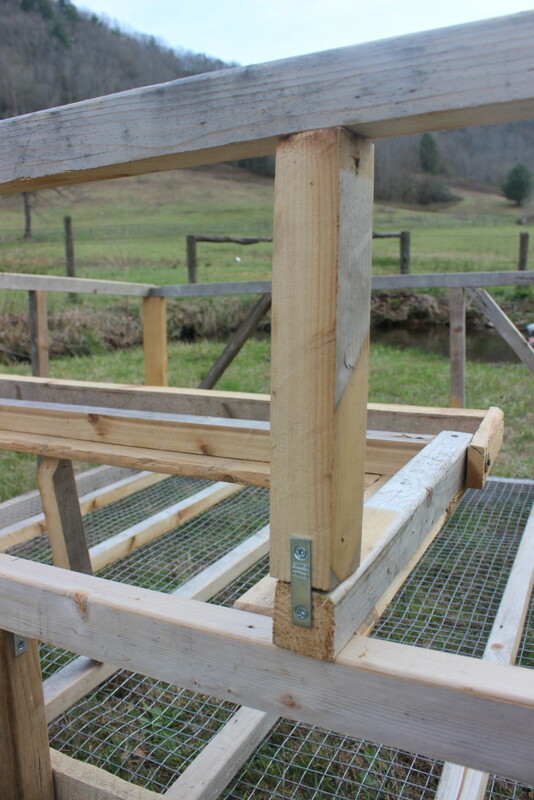 You see, if you don’t have a landing bar in the front of your nest boxes, it’s hard for your chickens to fly into their nests. They can be a bit clumsy. Now that I’m talking about characteristics of a chicken, I should mention that they’re also rather sloppy (aka poop in their nest box if you let them). So let’s make this landing bar swivel. 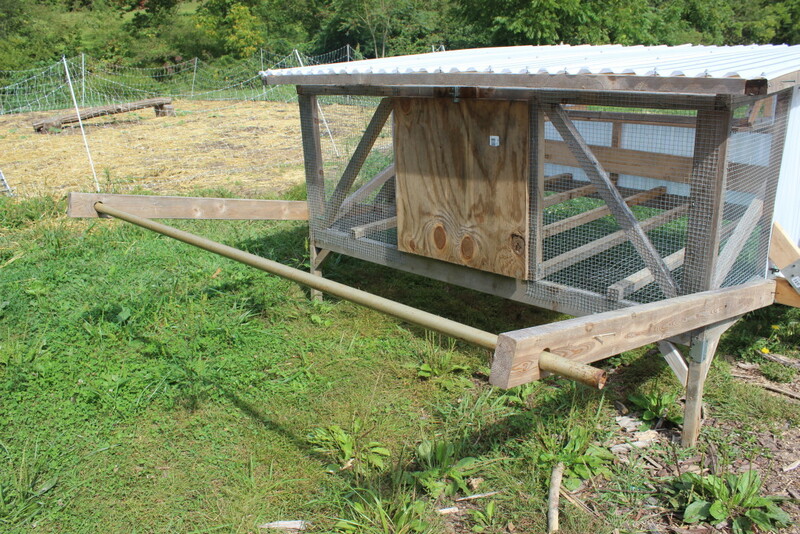 That way, if our chickens start perching in their nest boxes, we can lift the landing bar (in the afternoon after they’ve laid all their eggs) to be a nesting box blocker. 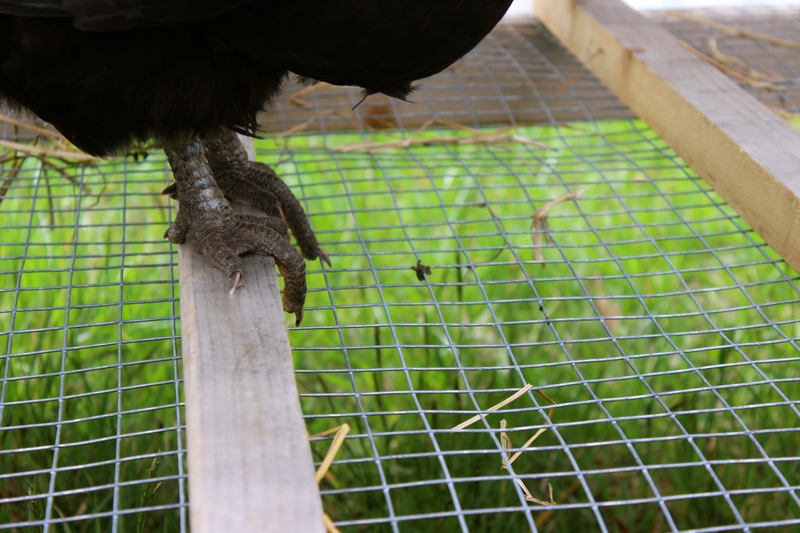 Then, they won’t perch in the nesting box and poop all over the place. Anway, attach your two 1X2X8” onto the sides of your 2X2X43”. 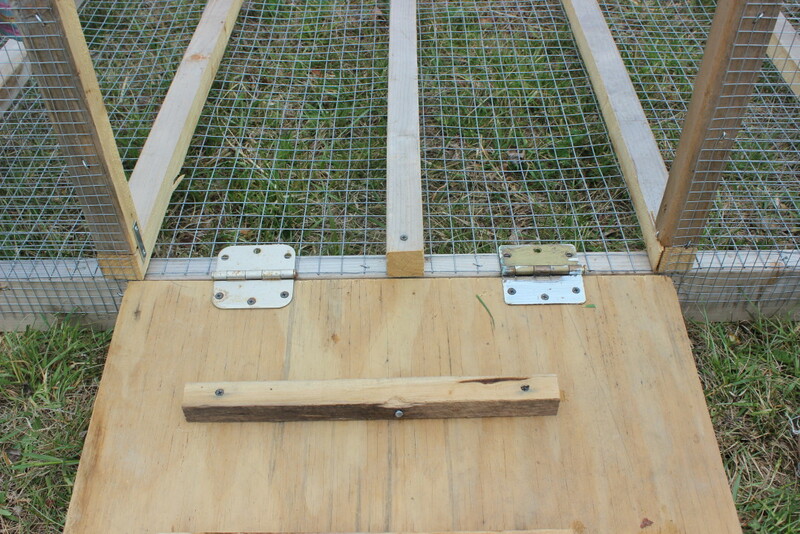 Make sure you put at least two screws into each side, otherwise the landing bar will twist. Go ahead and place your nesting box frame to the horizontal 2X2 running across the back of the chickshaw. Look carefully and you’ll see how I just rigged up some scrap lumber to hold the nesting box frame in place while I screwed it in. Place the frame in the center. To help you do this, just make a mark in the middle of your frame at 3’ and just try your best to center this thing by eyeing it. It’s not crazy critical that you get this part exactly right. 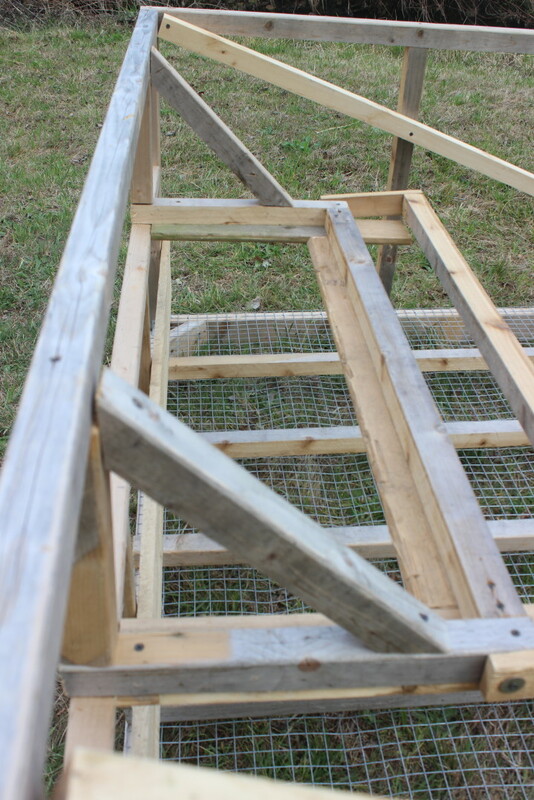 Screw in your vertical 9½” posts using a framing angle at the bottom and screwing in from the upper rail at the top. You’ll notice in the picture I used a “straight brace” to screw in the bottom. Yeh, no, don’t do that. I’ve since improved to framing angles. Now we’re going to put on the diagonal braces. Grab your 15” pieces and cut 45 degree angles on both ends, then drill them in as seen in the photo. You’ll have to forgive me, the foremost brace is blurry! At first, I didn’t even want to include this pic, but I think it’s super helpful. Let’s just pretend all is well, as we focus on the diagonal brace further away. It’s all nice and clear. Hey, I’m not perfect. 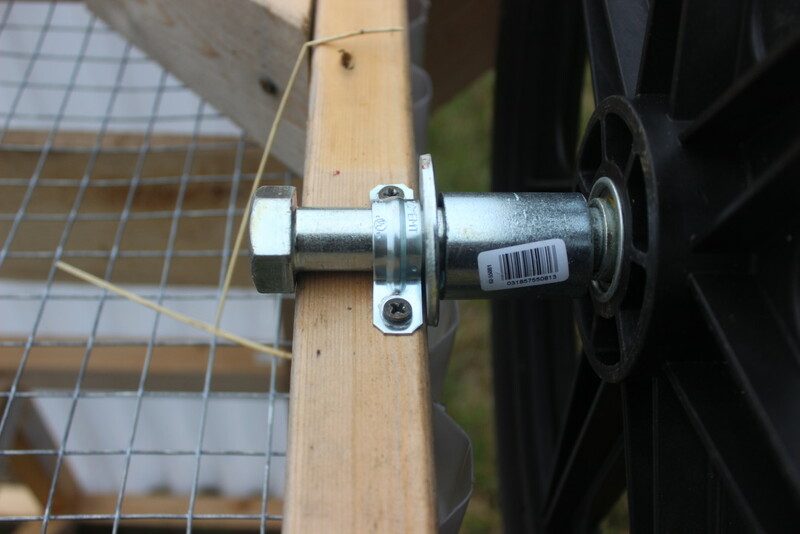 After you’ve put on those diagonal braces you can remove that “jerry rigged” scrap lumber that’s helping to hold up the nesting area. Now it’s time for some paneling. Place your middle paneling for the back wall (the one that’s 18” tall), and screw it in. The side panelings will overlap, and that’s ok.
Go ahead and attach your two side panels for the back wall (the ones that are 31”) . Yep, the corners will cover the opening to the nesting box. Take your tin snips and cut off the corners to reveal the opening into the next box. The side panels are a bit trickier, but by now, we’ve got this “tricky thing” down. Screw your “back” side panels in. They’re also 31” long. Place them so that the extra is sticking over the top. Go ahead and tin snip what’s “overhanging”. While you’re at it, screw in your “middle” side panels in too. There the ones that are 29 3/16”. Now, cut extra off of the top as well. Now, let’s slap together our door, it’s easy. 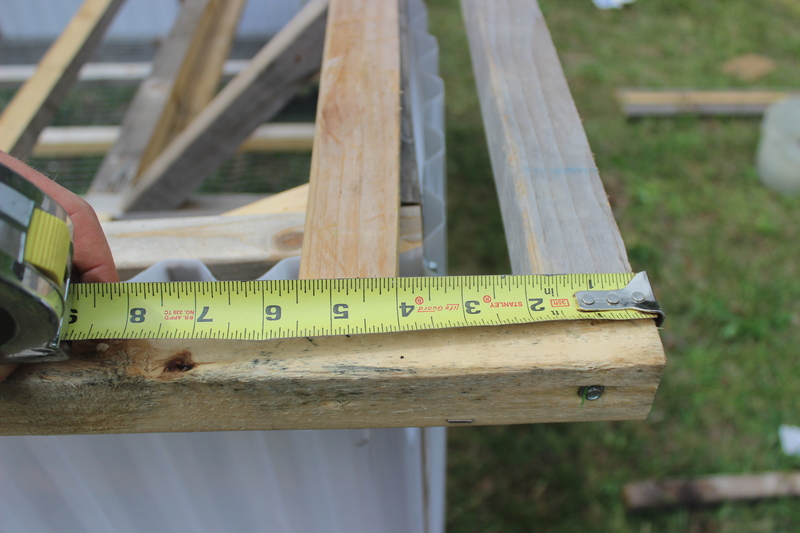 Screw in your 8”X1½” piece of ¾” of plywood (or similar) to the middle of the top bar along the front. First, flip the rickshaw (very carefully). I lifted it up to one side, then gently let it down. Mount your metal 2X4 joist hangers to the sides, as seen in the picture. Notice, one is at the corner area and the other is mounted about four feet away on one of the vertical wall posts (make sure you mount the bracket to these posts). I’m only going to show you my handiwork for one side, so make sure you repeat the process for the other side. Now, install your two 6” 2’X4’s into the bracket. You’ll notice the bracket I got will also accommodate at 6” of 2X4, so there’s some extra bracket (no big deal). You should still be able to put at least one screw on either side. You can now install your 11” diagonal braces after you’ve cut the ends to 45 degree angles. I think it’s best to go ahead and put your 4’¾” 2X4 on now. Screw it into your two 6” 2X4’s. Now it’s time to make some marks. I really over-emphasised my marks so you could see them in the photo below. Look closely, can you see them? There are three of them on the long 2X4. The one in the middle is 24’⅜” from the end. The other two are 14” from that middle mark. Go ahead, mark away. If you don’t understand what we’re doing with all these marks, I think you’ll get it in a minute. Now you screw in the two other 6” 2X4’s just outside your outer marks. These are your “inner” supports. Take a good look at the picture, and I think you’ll get the drift. These “inner” 2X4’s are for good measure to help support all the weight the outer 2X4 is going to carry. Last but not least, put a flat bracket on each end (for crazy beastly support). Notice how this bracket connects our three essential supports: the 6” piece, the diagonal piece, and the long 2X4. Do this on both sides of this “contraption”. Once again, I’m just showing you one side, so you’ll have to repeat these steps for the other side. Put your ¾” bolt through the wheel. Include the washer and spacer on one end. Set the wheel in the center of your wheel brace. You should have a line marked in the middle from step #39, so just center your bolt on that. Now, screw in your ½” metal pipe straps to hold down both sides of your bolt. BAM! You’ve mounted your wheels. Place your 13’½” 2X2 on your front corners and attach with the framing angles. Mount your angle clips to both sides. Screw in your two 6” diagonal braces to both sides of the leg. Cut the ends to 45 degree angles. It’s crazy, you can’t see the other angle brace in this photo, but it’s there. BAM!!! you’re done with the bottom. Now, flip this thing back over. I’m not sure which way you flipped it last time, but this time we need to make sure you flip it towards the wheels. If we flip it sideways we’ll put too much pressure on the leg. Anyway, just do this: Grab it on the front side (that’s the side with the two legs) and turn it up on it’s back. Then go and gently let the Chickshaw down. All the weight will end up on the wheels (no problem). 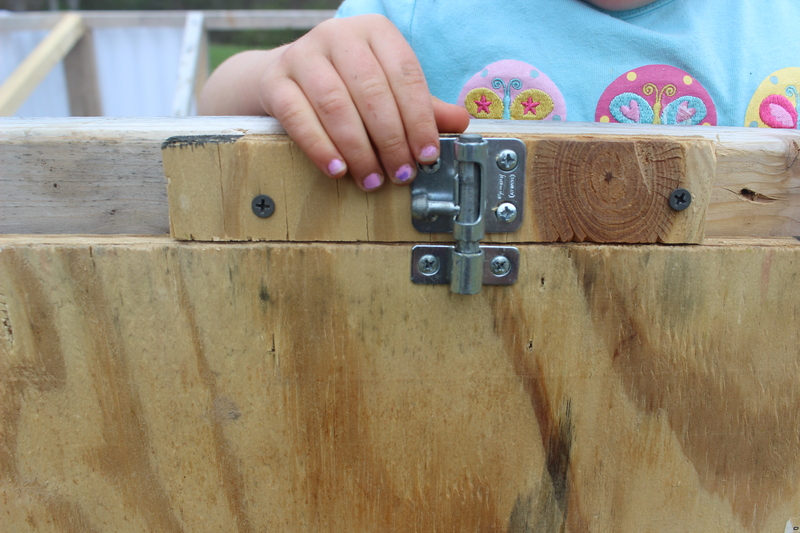 First, mount your hinges to the back wall of the main structure, two feet from either side. Now, take one of your 6’5” 2X2’s and attach it to your hinges. Make sure that your 6’5” piece is sticking 2 ½” out from either side (this insures your board is centered). Let’s build our roofing frame, it’s super simple. So, lay out your two, 6’8” 2X2’s parallel to each other, about 6’5” apart. Now make some marks along your 6’8” pieces at 4”, 20”, 40” and 60”. Screw in two of your 6’5” cross pieces onto either end of your 6’8” pieces. Then, screw in the remaining four, 6’5” pieces along your marks and one both sides. Now, go ahead and put the roof on. 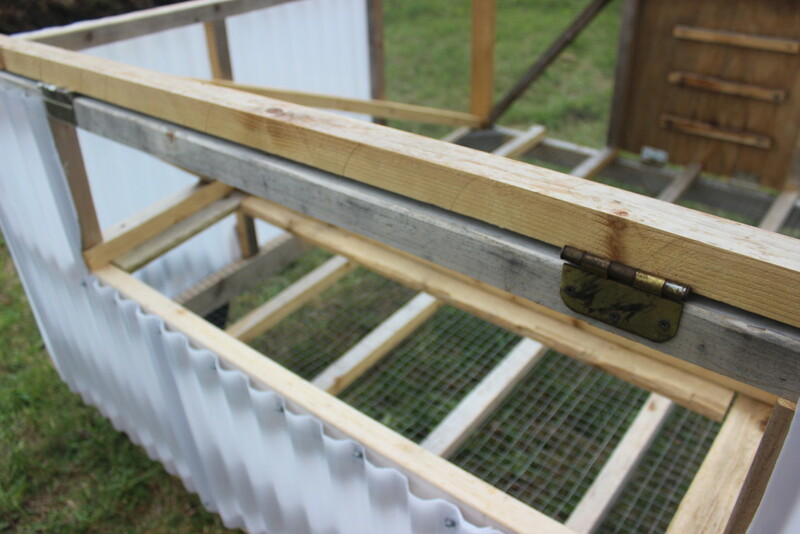 You’ve got to attach the roof frame to your “hinge” board. Here’s the trick though: The end of the roof frame has to stick out four inches from your “hinge” board like you see in the picture. 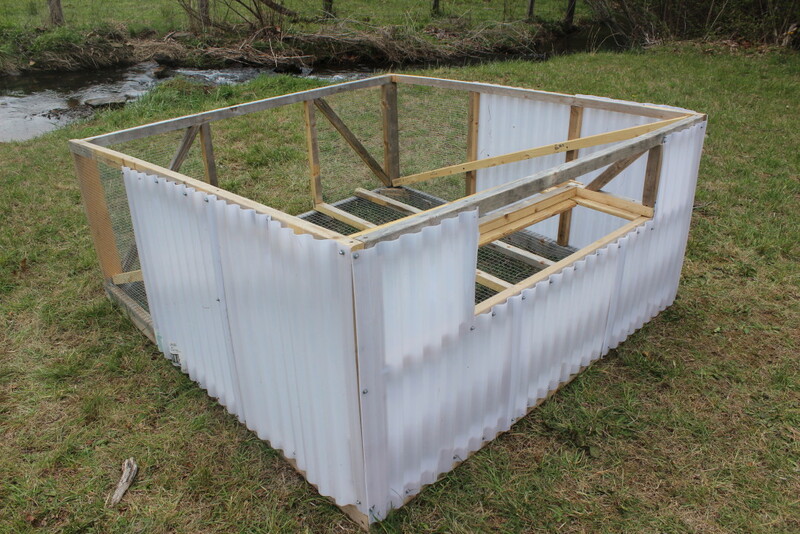 That way, your roof will stick out evenly on the front and back. Place your four 6’8” panels on the roof. A couple things to note: By now, you’ve noticed the roof is on a slant. Make sure to run the panels from front to back, NOT from side to side. I should also say that there will be a lot of overlap with your panels. That’s totally ok, and it doesn’t really matter where you overlap. If you’re particular, then by all means, measure and trim away. 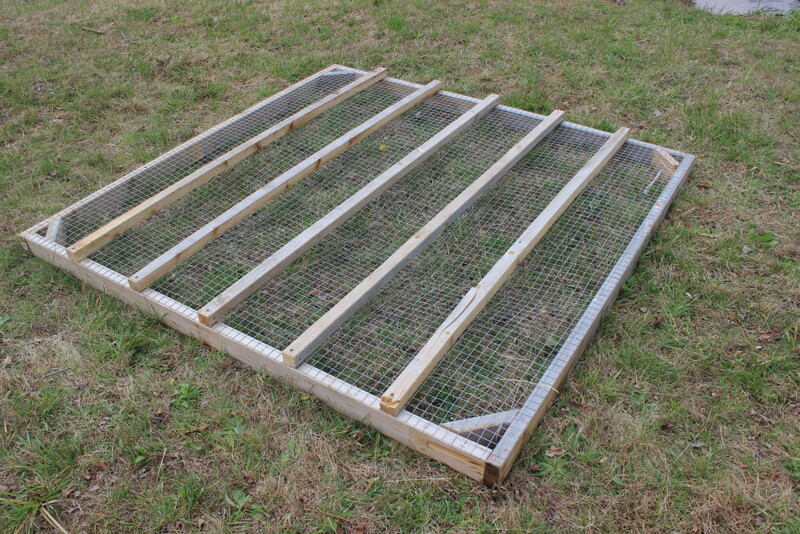 Screw the panels into your roofing frame using your roofing screws. In the photo below I’m placing the original 2X2 handles, but I’ve since upgraded it to 2X4’s (needed for extra strength). You’ll also notice the small wheel and wheel frame. Yeh, no, that didn’t work either. Nevertheless, the photo is still useful. First thing you’ll want to do is attach one end of your 5’6” handles to the frame. Just use one screw! That way your handle can still swivel so that you can adjust your height (before making it permanent in a second). Now, hold the handle a foot or more below your waistline. That’s where you want it to permantly to be. 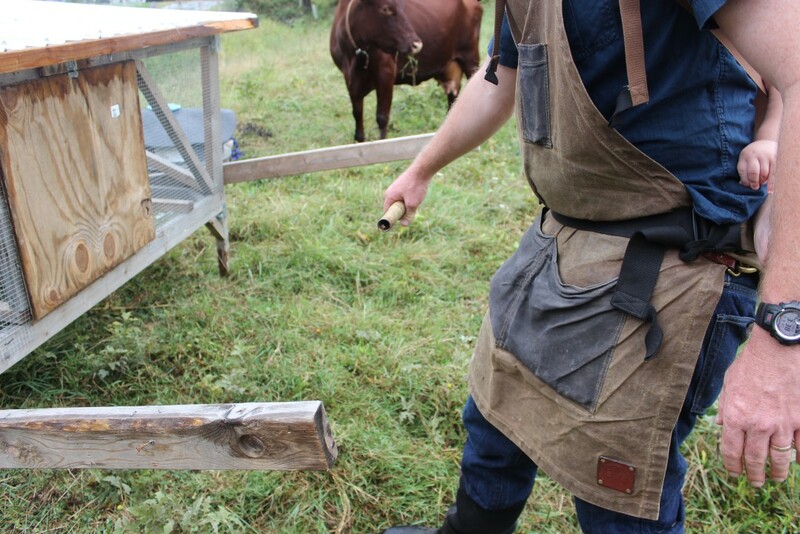 That way, when you pick up the handle to move the “shaw”, you’ll be holding the handle around your waistline. Somehow you’re going to have to mark your spot and screw in the handle to make it steady. If I remember right, I carefully held the handle while walking (more like shuffled) to where I could screw in the handle right where it needed to be. If you have someone with you, they could hold it in place or mark it for you. For the handle, you’ll need a strong metal pole (at least 6’11” long and not more than 2” in diameter). My pole was 6’11” long and 1 ¼” in diameter so if you’re going to source one (because you don’t have a scrap pole sitting around like I did) go ahead with my dimensions. For the sake of the rest of these instructions, I’ll assume you’re using my dimensions. If not, just adjust your plan accordingly. I know you can figure it out. Get a 1½” hole saw for drilling your holes in the handle for the poles, and well… drill the holes. And don’t worry, a hole saw is not an entirely new saw, it’s just a drill bit attachment for your current drill. If you’re not using my specs, just make sure your hole is drilled bigger than the diameter of the handle (for obvious reasons – You’ll need to get your pole into the holes). We better attach your Safety Hasps, cuz if you don’t your roof will fly off. Um… let’s just say my bad experience is your gain. I really think the picture speaks for itself, but I’ll explain a little bit. 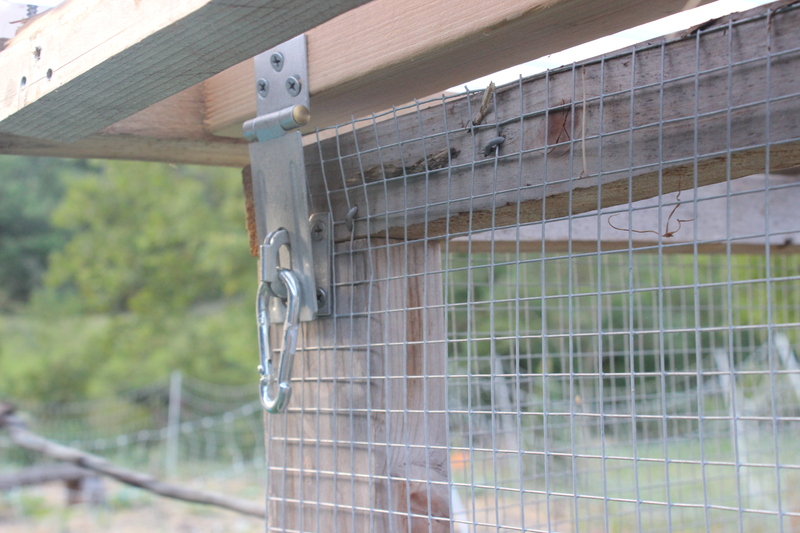 Mount your latch as seen in the picture, on the inner roofing frame (that should rest just on top of your main frame). It’s a little tricky screwing into that spot, so I screwed at an angle, and I used a long, 6” phillips screwdriver in my drill. Ok, now that you’re back from your little joy run. I realized I forgot something. The nesting boxes! The chickens will need somewhere to lay. But it’s pretty easy. 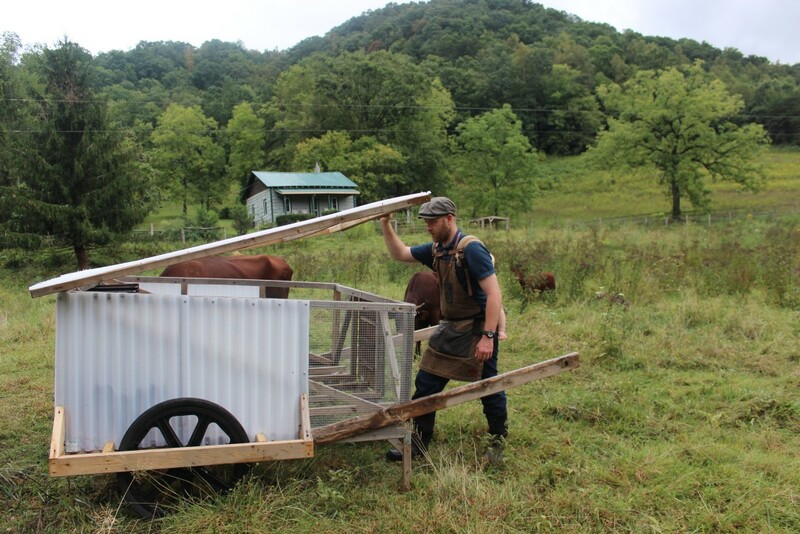 Take your sawzall or hand held PVC pipe saw and cut your entrances out of your milk crates. Notice, in the photo below, how I left a few inches on either side and left a bottom lip of about four inches. You can be a little flexible with this, as every milk crate layout is different and sometimes it’s just easier to cut it a certain way. Stuff the crates with straw or some other type of bedding and stick em in, making sure your opening is towards the inside. 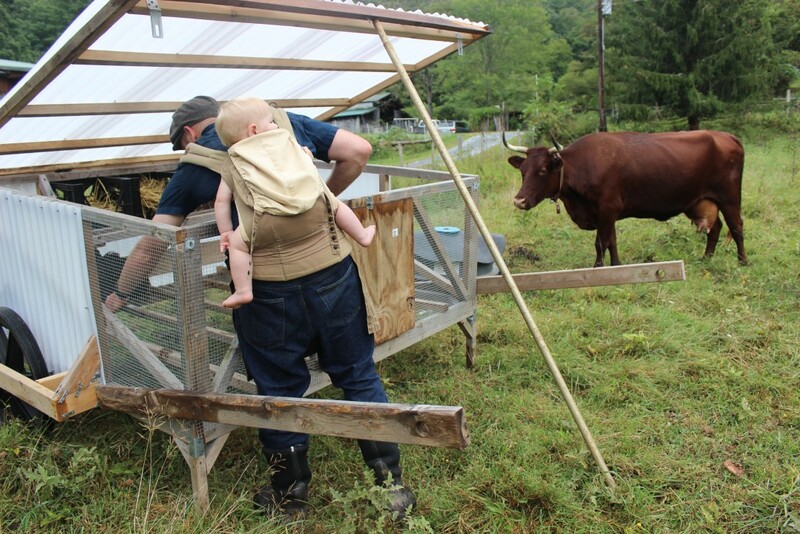 Ok folks… give yourself a big round of applause… Now go ahead and get some chickens in this thing. Probably the easiest way to do this is at night while the birds are lethargic and “blind”. Get them from their old house and place them in the chickshaw. 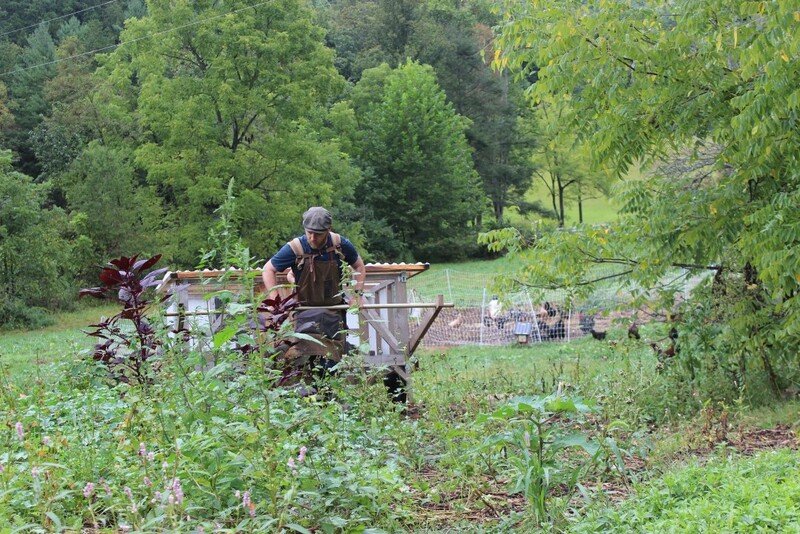 Let the chickens out in the morning, and you’ll notice most of them go back in that evening. You’ll probably have to round up a few the next couple of days until they get the gist. Be sure to hide their old house somewhere, otherwise some will seek it out (and get confused). Congratulations! You made your very own ChickShaw! Download the Plans to Get Started! 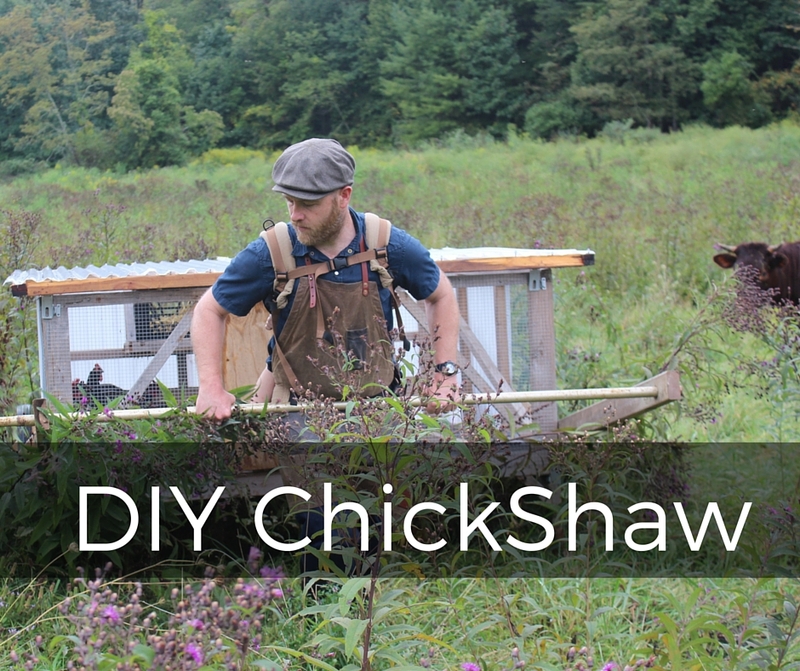 Download the FREE plans for my ChickShaw HERE.